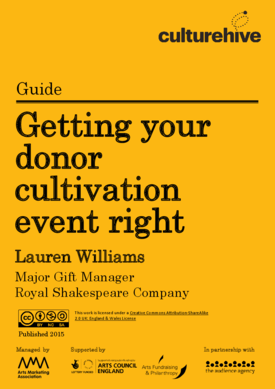 This guide provides key points to consider when organising a donor cultivation or stewardship event. From identifying the objectives of the event and who to invite through to targetting your messaging, selecting the most appropriate event host and making the most of your organisation's unique qualities. The guide includes a useful sample event timeline to help you plan cultivation or stewardship events. Lauren is Major Gift Manager at the Royal Shakespeare Company based in the playwright’s home town, Stratford-upon-Avon. She previously worked at Cambridge Arts Theatre as Development Manager during the theatre’s £1.3m foyer renovation. Past experience working in pensions and stage management has proved invaluable for the diverse skills required for a career in arts fundraising. Lauren graduated from the University of Sheffield in 2007 with a degree in History and remained in Sheffield to complete a Masters in Theatre and Performance. Earlier this year Lauren was part of the first cohort to complete the Institute of Fundraising’s Future Fundraising Leaders Programme.